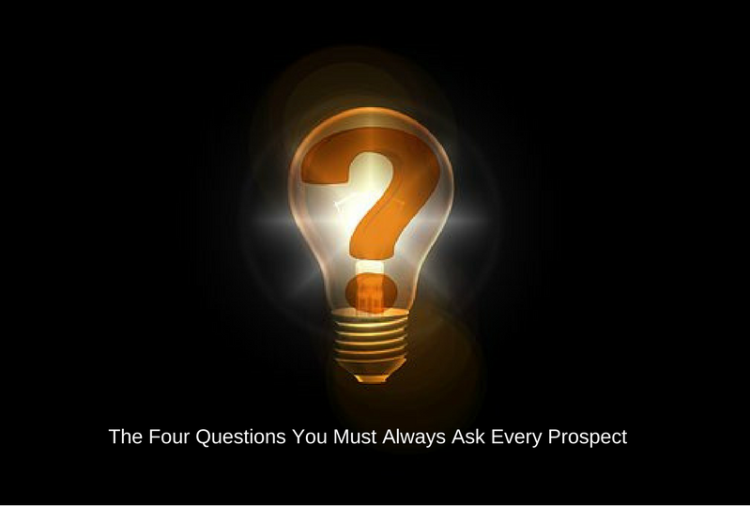 The Four Questions You Must Always Ask Every Prospect—and One Other You Need to Ask Right Now! 1. (If they currently work with an accountant). What services does your accountant provide you? There is no uniformity of fees and services vis-à-vis small businesses and accountants. This is where it’s so important to compare apples-to-apples—what is your prospect getting in return for the fees they pay. Those “tire-kickers” may tell you they pay their current accountant less than what you quoted them, but it’s very likely they are not getting the same level of service you would be providing. And, as always, you must build value into those services your prospect isn’t receiving now, especially if all their current accountant does is the year-end returns. 2. What would you change about your current accountant’s service? Try to engage their emotions here: Is their current accountant not timely in returning phone calls and e-mails? Do they feel they are not getting proper attention throughout the year? Do they feel they are paying too much for what they are getting? Ask what they would like to see done differently in this engagement. 3. (Regardless of whether they have an accountant). If our firm was so privileged to work with you, what would be most important to you in working with an accountant? What do you most wish to see in this engagement? Again, try to engage their emotions. This is where the prospect will reveal their hot buttons, and these will vary. Accessibility is very important for many business owners. For others, it may be avoiding problems with the taxing authorities. For still others, maintaining control over their bookkeeping, or a myriad of other reasons. The important point is, if you are providing a package of services consistent with the suite of services in NCI’s marketing program, the vast majority of smaller businesses will find what they are looking for. 4. Does your current accountant provide proactive tax planning? Ask your prospect how often their accountant calls or sends an e-mail with SPECIFIC suggestions about how they can reduce their taxes. Most small business owners never see this from their accountants. And the question you need to be asking your prospects now…. By the time you see this, it’s likely that most of your prospects will have had their year-end returns prepared for 2016. Ask how their year-ends turned out! Any nasty surprises? Any “sticker-shock” from an unexpectedly high tax bill? (Emphasize that judicious, pro-active tax planning could possibly have made a difference). Was their return prepared in a timely fashion? Were they perhaps put on extension for no apparent reason? Posing these questions may prompt your prospect to think about how working with your firm presents a better alternative to their current provider—one that makes a bottom-line difference in their business. Older PostWill This Tax Season Be Your Last?